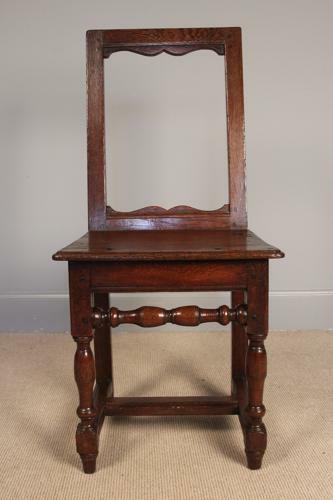 A late 17th century Oak backed stool in wonderful original condition. The backed joint stool having turned front legs and straight back legs adjoined by an 'H' stretcher rail, with a turned front rail and solid oak seat. The rectangular raked back with decorative top and bottom rails, initialled 'JP' to the top rail. Lovely colour to this peg joined stool with good patina. Strong and firm standing, circa 1680.